V for Vendetta is, to me, a series of excellent quotes with illustrations I could mostly do without. The story is interesting, but the pacing is so strange when read as a whole, and the art style was just not for me. The story follows V, a mysterious masked and caped crusader on a mission to disrupt a near-future Britain which has taken a sharp turn towards fascism following some kind of world war in the 1980’s. V declares himself to be an anarchist, and sets about creating the conditions for anarchy to subvert the strict controls of the fascist ruling regime. The story’s heroine, if you can call her that, is a young woman rescued by V when she is cornered and threatened by the secret police. Very little of her back story is revealed, and though he is the main character, very little is revealed about the enigmatic V either. When it comes to my overall feeling about the volume, it’s a conflict between fascination with the ideas and frustration with the execution. While I understand the point that was being made in revealing so little about V it did make for a rather frustrating read. It was never clear what his motivations were, if any, aside from revenge, and this coupled with the lack of ‘thought bubbles’ and other usual narrative clues found in graphic novels made for a slow and difficult reading experience. 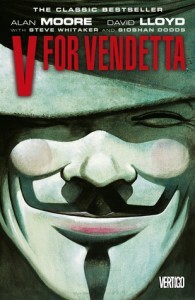 V for Vendetta is definitely an ‘adult’ graphic novel not a comic book for kids, and I would suggest that with the themes, violence and language it would be appropriate for ages 17 and up. While the ideas in it were interesting and will prompt further reading for me, this is not a graphic novel that I can see myself ever rereading. I do think it was worth the read, just to have a greater understanding of some of the context for things that have followed on and been inspired by it, but beyond that my enjoyment was limited.